Bringing Aaron Sorkin into a project can often bring all kinds of dividends. But I think of late an emerging trend is that he has this uncanny ability to make the confusing or just outright dull seem interesting. Case in point: some nerds build a website, and his scripting makes The Social Network one of the finest films of the last decade. Baseball statistics being used as a recruitment tool? Moneyball, one of the finest sports dramas ever made. A trio of Apple product launches as a catalyst for the life of Steve Jobs? He makes it happen. Even the machinations of daily political life can be rendered into the best TV drama, like, ever, in The West Wing. He can occasionally take an ill-conceived step, but the worst episodes of The Newsroom are compensated by the best ones. Sorkin’s strongest suit is the details he brings to the dialogue, and how his characters deliver it. It’s rapid fire, and his players are all just astonishingly whip-smart (often to their own detriment). And much like the legal back-and-forth he delivered in his play (and later screenplay) for A Few Good Men (courtroom as tennis match), he does in Molly’s Game, which in-part adapts Molly Bloom’s memoir of running a recurring high-stakes poker game in NY and LA, and in part depicts the legal stoush she found herself in two years after all bets were off (literally). The lines are so crisp, his language so refined, witty and smart, you want to be able to pause, re-watch and soak it all in. I know nothing of poker, and as best I can tell from seeing championship matches on TV, or how it is depicted in film, or how its professional players seem to be in real life…the game is one populated by scumbags. I don’t know the rules, the strategies, and wouldn’t know a straight from a flush or a full house if you threw it at me. 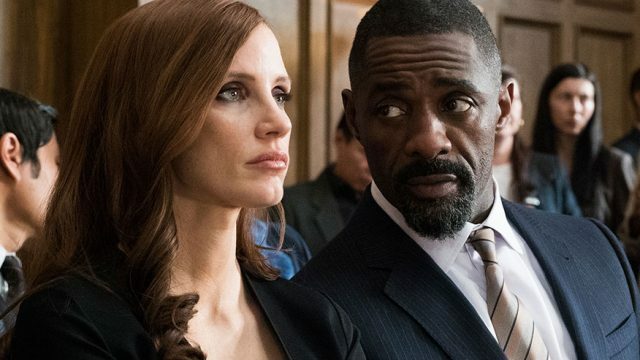 Sorkin does as much in Molly’s Game, having his first person narrator take you through the ins-and-outs of poker as its being played, but even then it’s not a lot more than numbers and colours and rat-a-tat dialogue. Adam McKay did his best to explain short selling to the punters in The Big Short (a nice effort, if somewhat condescending), whereas Sorkin just plows through. But again, it doesn’t seem to matter because it’s just so danged entertaining. I can see a time in the future when Jessica Chastain is regarded as the new Meryl Streep – just constantly good, varied in her portrayals, reliable in that she can (and often does) essentially do as good a job (if not better) than anyone working today. So very good in Zero Dark Thirty, A Most Violent Year, and The Tree of Life. You’d put her up for playing Hitler and just assume she’s going to do something spectacular with it. She manages to handle the pace and delivery of this Sorkin dialogue in a series of superbly conceived scenes where she is paired off against Idris Elba (charismatic, commanding as always), the surprisingly nasty Michael Cera, and Kevin Costner as her flawed but loving father. Costner has a couple of scenes, and in the film’s third act gets to have a moment with Chastain which makes you wonder why people don’t hire him to be in better films these days (watching it makes one long for the Tin Cup, JFK, A Perfect World days of his career; he’s a great actor when he has the right material). Molly’s Game is Sorkin’s debut as director, and given his pedigree as a writer, it’s easy to see where he picked up the technical skills. It’s a solid, engrossing drama about a flawed human profiting from the whims of degenerates. And it’s Sorkin at his most Sorkin-y, which will either see you next in line at the box office, or running for the hills.